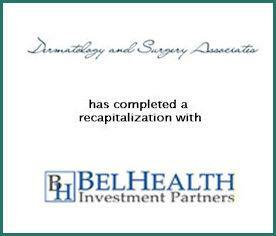 Dermatology and Surgery Associates, a leading provider of general, cosmetic, and surgical dermatology services based in East Bronx, New York, has completed a recapitalization with BelHealth Investment Partners. Together with Millburn Laser Center, Sharon Scherl Dermatology and Spring Street Dermatology, Dermatology and Surgery Associates will form NavaDerm Partners. Provident Healthcare Partners (“Provident”) served as exclusive financial advisor to Dermatology and Surgery Associates. The terms of the transaction were not disclosed. The Northeast-based NavaDerm is a regional dermatology platform, consisting of 19 physicians in five locations in New York and New Jersey providing comprehensive dermatology services and products including medical, surgical and cosmetic procedures. The creation of NavaDerm represents an exciting opportunity to create a leading regional dermatology platform in a highly fragmented, growing industry with positive economic tailwinds and stable reimbursement. “Drs. Rosen and Whang have built Dermatology and Surgery Associates into the leading provider of medical dermatology services in the Bronx. With BelHealth as a partner, we believe they are well-positioned to expand their reputation for clinical excellence into new markets in New York and New Jersey,” commented AJ Shekar, Vice President at Provident. “Provident played a vital role every step of the journey. They took the time to understand our practice and guided us through a steep learning curve of business and legal jargon. We thank them for their expertise and patience,” stated Dr. Douglas Rosen, founder of Dermatology and Surgery Associates. Dermatology and Surgery Associates, founded by Dr. Douglas Rosen in 1983, includes six highly-qualified and awarded physicians operating in one, eight exam room location, and serves approximately 14,000 unique patients per year. The company provides acne treatments, Botox injections, chemical peels, general dermatologic exams, Juvaderm fillers, Mohs surgery, plastic surgery, psoriasis laser, and skin cancer screenings. For more information, visit www.dermatologyandsurgeryassociates.com. Provident is the leading investment banking firm specializing in merger and acquisition advisory, strategic planning, and capital formation for healthcare companies. The firm has a comprehensive knowledge of market sectors and specialties, including the dermatology sector. Provident also has unsurpassed experience and insight into the M&A process, which includes working with a number of buyers such as private equity firms and strategic groups. For more information, visit www.providenthp.com.